This knife belongs to the Benchmade Black Class. These are knives that are used by professionals in life and death situations, people who rely on their equipment, including their knives, in potentially deadly situations. 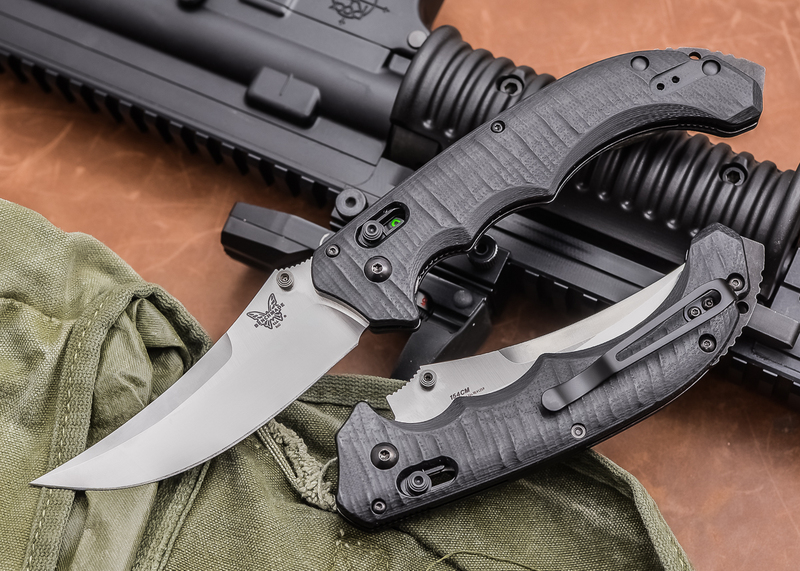 These Benchmade products therefore represent the very pinnacle of quality and reliability, used by law enforcement and public safety to elite military troops. The Benchmade philosophy, consistently put into practice, of marrying the right materials to the right application, and providing reliable, trustworthy products, is never clearer than when these knives are used by emergency services and the military. Originally, the Benchmade Bedlam® was designed to be used by the security forces of a King. It is for this reason that the knife sports a scimitar-like design. It is imposing, because it is very large, commanding respect on sight. Customers can choose to receive the manual-opening option, with an AXIS mechanism, or they can opt for the automatic opening version, which deploys quickly and smoothly with the Auto Axis mechanism. Whichever mechanism you choose, the blade steel is 154CM (58-61 HRC), making it very strong and durable. The blade is a sizable 4.00" (10.16cm) long with an impressive thickness of 0.121" (3.07mm). Open, the knife is 9.76" (24.79cm) and it will be 5.76" (14.63cm) while closed. The thickness of the handle measures 0.60" (15.24mm) and the overall weight of the knife comes in at 7.30oz. (206.95g). The scimitar blade is a large, curved style blade, also sometimes described as a Persian style blade. It is a robust shape with a strong point for piercing. In addition to this you can choose a plain edge or a serrated edge, according to the type of tasks you are likely to be performing. Also choose between a satin finish or a coated blade, for extra rust protection and anti-corrosion, according to your preference. These knives come with deep carry clips, so the knife sits nice and deep, and the clip position is reversible tip-up. Being able to carry this knife quite deep in the pocket allows for some subtlety, exceptional for such a large knife. This is a big knife and so it needs a handle that can stand up to a variety of tough tasks. It needs a strong handle with exceptional grip and comfort. The G10 handle provides just these features. Overall, it is a very comfortable feel for a big knife. The long grip allows the user to employ a close or long range forward grip according to the situation the user finds him or herself in. Thanks to the scimitar blade, the Benchmade Bedlam® can be used for hooking and can provide very effective outward cuts in a reverse grip. The G10 scales are sculpted beautifully to provide traction for fingers and hands, but not fabric. Benchmade understands that it is important for users of a knife like this to have excellent grip. The mechanisms are also top-notch, deploying quickly and smoothly. The patented AXIS and Auto Axis mechanisms are perfect, providing users with reliability and security. They both lock up securely too and really are exceptionally well made. The thumb studs combined with the AXIS lock work extremely well together. It is fully ambidextrous, it is simple and it works. The washers mean that the action is extremely slick. If you are buying a Black Class product you can guarantee that it has been tried and tested and that it continues to be put through its paces. Equipment used by military personnel and public safety organizations is necessarily of the highest caliber in terms of quality and reliability. No matter what you intend to use your Benchmade Bedlam® for, you know that somewhere out there this product is being used in situations where it can make the difference between life and death. 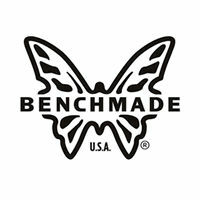 This is how much faith people put in Benchmade and this product. The Bedlam® has been described as a unique knife. It is certainly one of the biggest folders created by Benchmade. Also while G10 is usual on a Benchmade knife, the sculpted G10 is much less common, creating tiger-like stripes along the handle that not only look exceptional but create a great gripping surface for your hand. The Benchmade Bedlam® is a great-looking knife overall. The shape alone would interest any number of collectors, including martial artists who might appreciate the possible professional and self-defense applications of such a knife. The long reach of the lengthy handle is great. Ergonomically, it can be handled in different grips, including a reverse grip. When you hold this knife, you will know that it has been created with real use in mind. This is not a knife that is designed for show. Years of understanding and experience have gone into crafting a knife that feels like it has been made for your hand. The knife has been demonstrated to be good for use by people with larger hands as well as average sized hands. The finger grips, in addition to the sculpted G10, mean that users of this knife have a lot of control and will be able to use this knife comfortably, even in extreme or tricky circumstances. While this is designed as a tactical knife, the Benchmade Bedlam® could be suitable as an everyday carry. Despite its size, the quality of its manufacture, meaning the ergonomic handle, perfect fold, and eminently usable clip, mean that it actually sits remarkably well in the pocket. As with all Benchmade knives, this is a high-quality knife that is intended for repeated use. It will not loosen up over time and there will be no signs of wobble or play in the mechanism after consistent application. You will see the quality as it comes out of the packaging and you will feel it when it is in your hand and this is not going to change over time. There is no reason why this knife should not last you a lifetime, with proper care. Whether you use this knife on occasions or as an everyday carry, this is a great-looking knife with a fantastic blade. It is very practical, exceptionally well-crafted and will stand up to any competition, eating up any and all everyday tasks you put in its path. View our line of Benchmade Bedlam® knives and find the one that’s right for you. You can contact us by phone at (423) 910-9070 or visit us at our showroom in Ooltewah, TN. You can handle and buy everything we have on the website right in our store.